UK: The UK has approved planning for the electrical system of Innogy's 900MW Triton Knoll offshore project, meaning the site is now fully consented ahead of the government's next subsidy auction. German developer Innogy — the new renewables division of RWE — said the announcement from the newly created business, energy and industrial strategy department was a significant milestone. It is currently developing the project in a 50-50 partnership with Norwegian utility Statkraft. Under the new consent order, export cable routes from the project, onshore underground cables and onshore infrastructure are all approved. The offshore turbines were consented in 2013. "A very thorough six-month long examination has enabled a wide range of local views to be considered in the final proposals and we are very grateful to everyone who has taken part in this process. "Obtaining consent is the start of the next phase in the project's lifecycle, and we look forward to working with the community and stakeholders as we take the project forward into construction," said Melissa Reid, consent delivery manager for the project, . Innogy did have some difficulty in the planning process for the electricity system. In August 2014, it withdrew an application to access private land to survey the proposed cable route. The transmission cable will make landfall at Anderby Creek, Lincolnshire, east England. A 60-kilometre cable will connect the system to the national grid at Bicker Fen, via an intermediate electrical compound at Orby. 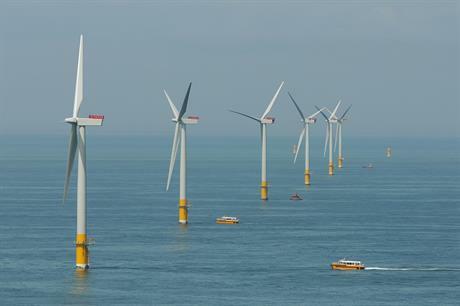 Project director James Cotter added: "Triton Knoll aims to be one of the most cost competitive offshore wind farms in Europe by seeking best value in all aspects of the project." Innogy must now wait until the next UK subsidy auction for a contract for difference agreement. The UK government had indicated the first of three proposed auctions, supporting 4GW of offshore wind, would take place before the end of 2016 — but with the lack of any further detail, that is increasingly unlikely. Project partner Statkraft has already indicated it would sell its portion of the project, after announcing it would stop investment in offshore wind in December 2015.